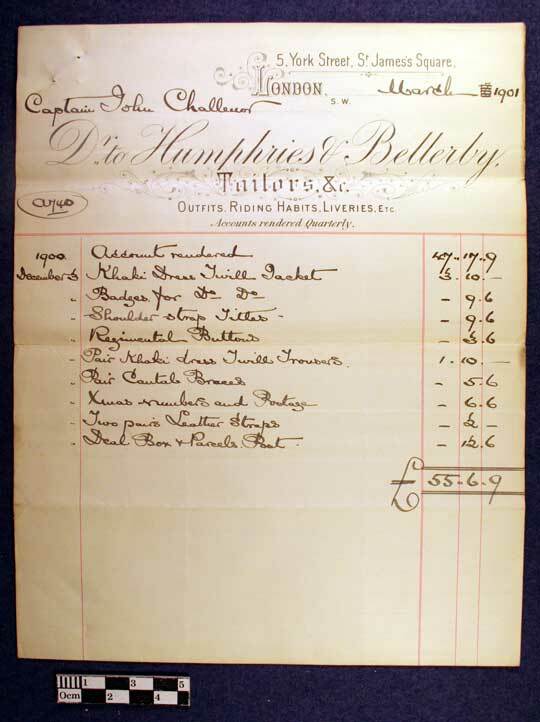 Letter from Captain John Challenor, King’s Own Royal Lancaster Regiment, Bowerham 15 Apr 1904 to Edward re payment of money owing. Letter from Captain John Challenor, King’s Own Royal Lancaster Regiment, Bowerham 8 Aug 1904 to Edward re correspondence from his wife. Letter from Captain John Challenor , King’s Own Royal Lancaster Regiment, Bowerham 13 Sep 1904 to Edward re letter from wife. 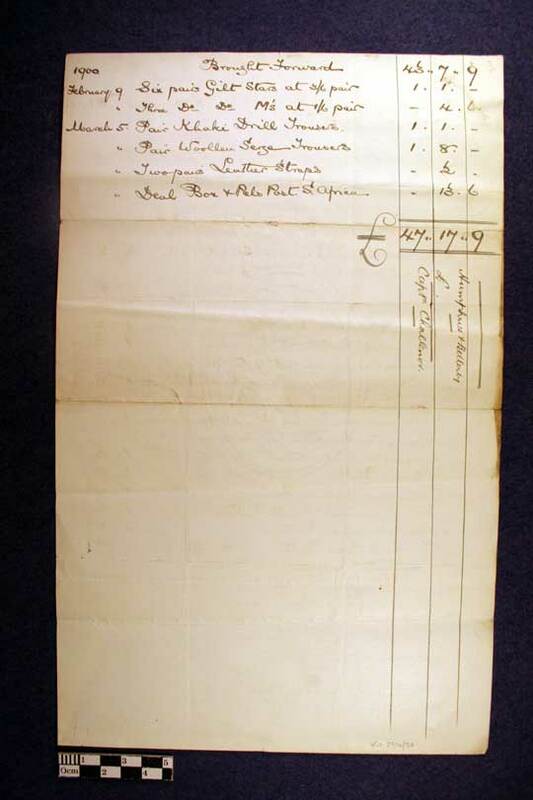 Letter to Captain John Challenor from Captain Lloyd, King’s Own Royal Lancaster Regiment, Bowerham PMC 4th RD re cheque for £24 not being met and being reported to War Office. 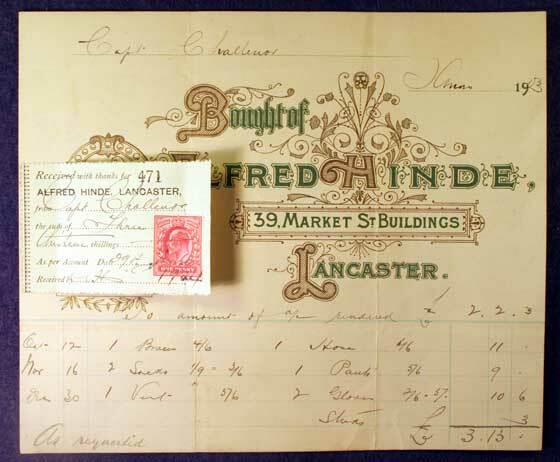 Letter from Moore & Son London to Captain John Challenor 3rd Battalion King’s Own Royal Lancaster Regiment 3 Sep 1902 Re notice of charge on proceeds of sale of house. 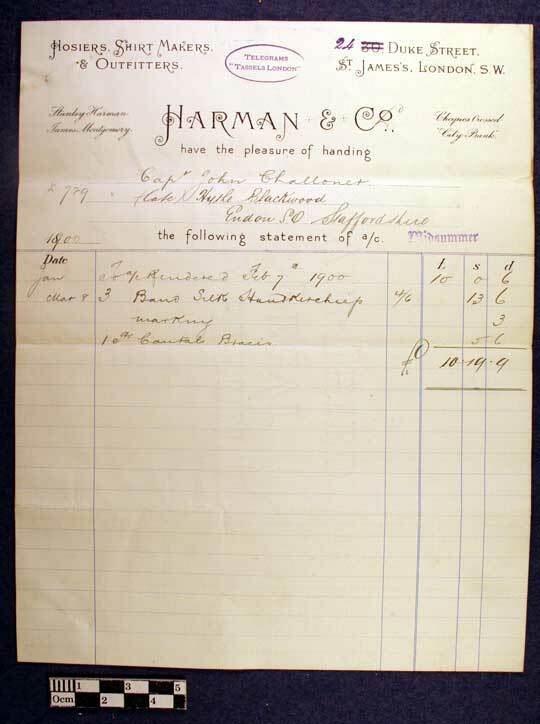 Invoice to Captain John Challenor, 3rd Battalion, King’s Own Royal Lancaster Regiment, Jan 1900 from Harman & Co, Hosiers, Shirt Makers & Outfitters. Of 24 Duke Street, St. James’s, London. 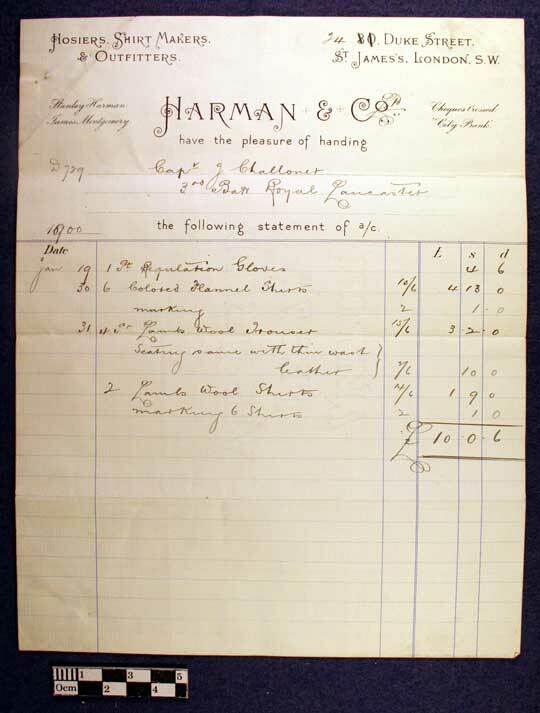 Invoice to Captain John Challenor, 3rd Battalion, King’s Own Royal Lancaster Regiment, Jan 1901 from Harman & Co, Hosiers, Shirt Makers & Outfitters. Of 24 Duke Street, St. James’s, London. 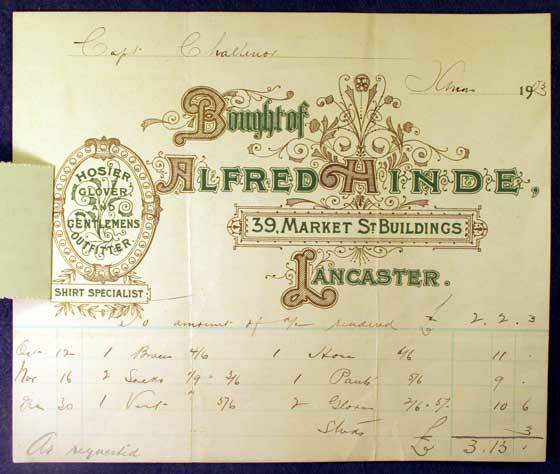 Invoice to Captain Challenor, Christmas 1903, By Alfred Hinde, 39 Market Street Buildings, Lancaster. 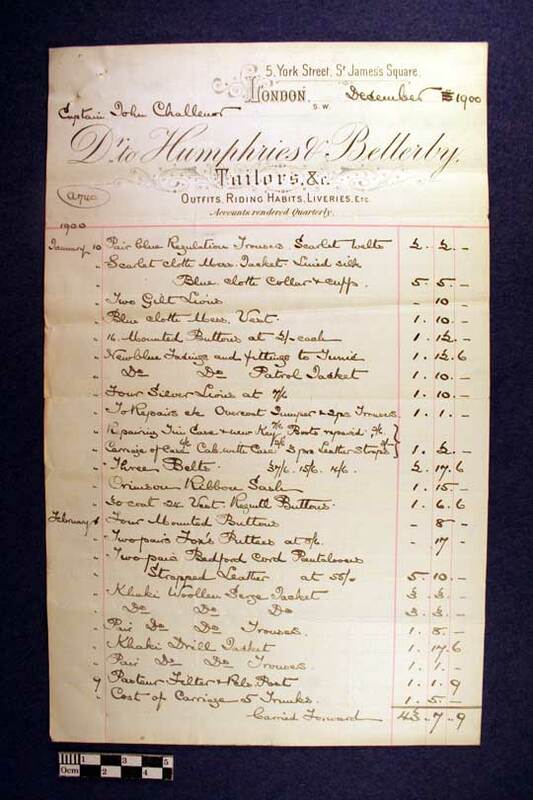 Hosier, Glover & Gentlemen's Outfitter. 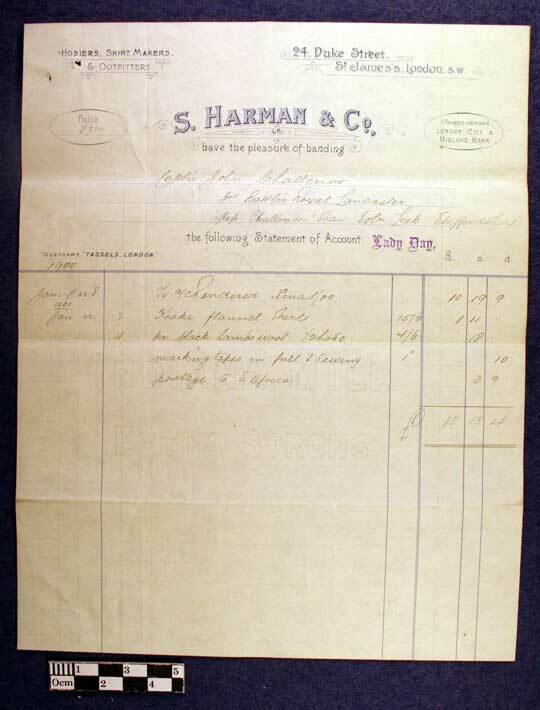 Receipted as paid 29 Jan 1904.